1 Prior to 1999: Irish pound. The Republic of Ireland ( Irish: Poblacht na hÉireann) is the official description of the sovereign state which covers approximately five-sixths of the island of Ireland, off the coast of north-west Europe. The state's official name is Ireland (in the Irish language: Éire) and this is how international organisations and residents usually refer to the country. It is a member of the European Union, has a developed economy and a population of slightly more than 4.2 million. The remaining sixth of the island of Ireland is known as Northern Ireland and is part of the United Kingdom. The constitution provides that the name of the state is Éire, or, in the English language, Ireland. However, the state is sometimes referred to as the "Republic of Ireland," in order to distinguish it from the island of Ireland. The name Republic of Ireland came into use after the Republic of Ireland Act defined it as the official description of the state in 1949 (the purpose of the act being to declare that the state was a republic rather than a form of constitutional monarchy). It is also the accepted legal name of the state in the United Kingdom as per the Ireland Act 1949. Today, while Republic of Ireland is a valid term for the state, Ireland is used for official purposes such as treaties, government and legal documents, and membership of international organisations. However with Irish being named the European Union's 21st official language in 2007; the state will be referred to in both constitutional official languages, the Irish and English languages, similarly to other countries such as Finland and Belgium using more than one language at EU level. This means the label 'Éire Ireland' will be used on various signage and nameplates referring to the state. The state is also known by many other names in English, such as Éire, The Free State and the Twenty-six Counties. The use of Éire when speaking English in Ireland has become increasingly rare, not least due to historical condescending connotations. Often in the United Kingdom the state is referred to as Southern Ireland, though this term is used informally and was only used officially for a brief period in the state's history. Irish people sometimes refer to the state as "The South" - it is not uncommon to hear Northern Irish people talking about going "down south". The same is true of "The North". When entering Northern Ireland from the South, you are said to be going "up north". 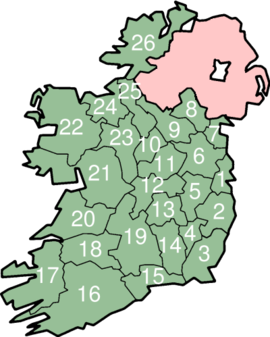 The names "North" and "South" are used in common speech to refer to the individual states, rather than their geographical location; when one enters County Donegal (in the Republic) from County Fermanagh (in Northern Ireland), one is still said to be going "down south", despite Donegal being further north geographically than Fermanagh. The state has had more than one official title. The revolutionary state, declared in 1919 by the large majority of Irish Members of (the United Kindom) Parliament elected in 1918, was known as the " Irish Republic"; when the state achieved de jure independence in 1922, it became known as the " Irish Free State" (in the Irish language Saorstát Éireann), a name that was retained until 1937. To confuse matters further, from 1 January 2007, the country will be known, at EU level as Eire Ireland in official documents. This is due to the Irish Language becoming an official language of the European Union on that date . The state known today as the Republic of Ireland came into being when 26 of the counties of Ireland seceded from the United Kingdom of Great Britain and Ireland (UK) in 1922. The remaining six counties remained within the UK as Northern Ireland. This action, known as the Partition of Ireland, came about because of complex constitutional developments in the early twentieth century. From 1 January 1801 until 6 December 1922, Ireland was part of the United Kingdom. During the Great Famine from 1845 to 1849 the island's population of over 8 million fell by 30 percent. One million Irish died of starvation and another 1.5 million emigrated,(see: Mokyr, Joel (1984). "New Developments in Irish Population History 1700-1850". Irish Economic and Social History xi: 101-121. ) which set the pattern of emigration for the century to come and would result in a constant decline up to the 1960s. From 1874, but particularly from 1880 under Charles Stewart Parnell, the Irish Parliamentary Party moved to prominence with its attempts to achieve Home Rule, which would have given Ireland some autonomy without requiring it to leave the United Kingdom. It seemed possible in 1911 when the House of Lords lost their veto, and John Redmond secured the Third Home Rule Act 1914. The unionist movement, however, had been growing since 1886 among Irish Protestants, fearing that they would face discrimination and lose economic and social privileges if Irish Catholics were to achieve real political power. Though Irish unionism existed throughout the whole of Ireland, in the late nineteenth and early twentieth century unionism was particularly strong in parts of Ulster, where industrialisation was more common in contrast to the more agrarian rest of the island. (Any tariff barriers would, it was feared, most heavily hit that region.) In addition, the Protestant population was more strongly located in Ulster, with unionist majorities existing in about four counties. Under the leadership of the Dublin-born Sir Edward Carson and the northerner Sir James Craig they became more militant. In 1914, to avoid rebellion in Ulster, the British Prime Minister H. H. Asquith, with agreement of the leadership of the Irish Parliamentary Party leadership, inserted a clause into the bill providing for home rule for 26 of the 32 counties, with an as of yet undecided new set of measures to be introduced for the area temporarily excluded. Though it received the Royal Assent, the Third Home Rule Act 1914's implementation was suspended until after the Great War. (The war at that stage was expected to be ended by 1915, not the four years it did ultimately last.) For the prior reasons Redmond and his Irish National Volunteers supported the Allied cause, and tens of thousands joined the British Army. In January 1919, after the December 1918 general elections, 73 of Ireland's 106 MPs elected were Sinn Féin members who refused to take their seats in the British House of Commons. Instead, they set up an extra-legal Irish parliament called Dáil Éireann. This Dáil in January 1919 issued a Unilateral Declaration of Independence and proclaimed an Irish Republic. The Declaration was mainly a restatement of the 1916 Proclamation with the additional provision that Ireland was no longer a part of the United Kingdom. Despite this, the new Irish Republic remained unrecognised internationally except by Lenin's Russian Republic. Nevertheless the Republic's Aireacht (ministry) sent a delegation under Ceann Comhairle Sean T. O'Kelly to the Paris Peace Conference, 1919, but it was not admitted. After the bitterly fought War of Independence, representatives of the British government and the Irish rebels negotiated the Anglo-Irish Treaty in 1921 under which the British agreed to the establishment of an independent Irish State whereby the Irish Free State (in the Irish language Saorstát Éireann) with dominion status was created. The Dáil narrowly ratified the treaty. The Treaty was not entirely satisfactory to either side. It gave more concessions to the Irish than the British had intended to give but did not go far enough to satisfy republican aspirations. The new Irish Free State was in theory to cover the entire island, subject to the proviso that six counties in the north-east, termed "Northern Ireland" (which had been created as a separate entity under the Government of Ireland Act 1920) could opt out and choose to remain part of the United Kingdom, which they duly did. The remaining twenty-six counties became the Irish Free State, a constitutional monarchy over which the British monarch reigned (from 1927 with the title King of Ireland). It had a Governor-General, a bicameral parliament, a cabinet called the "Executive Council" and a prime minister called the President of the Executive Council. The Irish Civil War was the direct consequence of the creation of the Irish Free State. Anti-Treaty forces, led by Eamon de Valera, objected to the fact that acceptance of the Treaty abolished the Irish Republic of 1919 to which they had sworn loyalty, arguing in the face of public support for the settlement that the "people have no right to do wrong". They objected most to the fact that the state would remain part of the British Commonwealth and that Teachtaí Dála would have to swear an oath of fidelity to King George V and his successors. Pro-Treaty forces, led by Michael Collins, argued that the Treaty gave "not the ultimate freedom that all nations aspire to and develop, but the freedom to achieve it". At the start of the war, the Irish Republican Army (IRA) split into two opposing camps: a pro-treaty IRA and an anti-treaty IRA. The pro-Treaty IRA became part of the new National Army. However, through the lack of an effective command structure in the anti-Treaty IRA, and their defensive tactics throughout the war, Collins and his pro-treaty forces were able to build up an army capable of overwhelming the anti-Treatyists. British supplies of artillery, aircraft, machine-guns and ammunition boosted pro-treaty forces, and the threat of a return of Crown forces to the Free State removed any doubts about the necessity of enforcing the treaty. The lack of public support for the anti-treaty Irregulars, and the determination of the government to overcome them, contributed significantly to their defeat. The National Army suffered 800 fatalities and perhaps as many as 4,000 people were killed altogether. As their forces retreated, the Irregulars showed a major talent for destruction and the economy of the Free State suffered a hard blow in the earliest days of its existence. On 29 December 1937 a new constitution, the Constitution of Ireland, came into force. It replaced the Irish Free State by a new state called simply "Ireland". Though this state's constitutional structures provided for a President of Ireland instead of a king, it was not technically a republic; the principal key role possessed by a head of state, that of symbolically representing the state internationally remained vested, in statute law, in the King as an organ. On 21 December 1948 the Republic of Ireland Act declared a republic, with the functions previously given to the Governor-General acting on the behalf of the King given instead to the President of Ireland. The Irish state had remained a member of the then- British Commonwealth after independence until the declaration of a republic on 18th April 1949. Under Commonwealth rules declaration of a republic automatically terminated membership of the association; since a reapplication for membership was not made, Ireland consequently ceased to be a member. The Republic of Ireland joined the United Nations in 1955 and the European Community (now the European Union) in 1973. Irish governments have sought the peaceful reunification of Ireland and have usually cooperated with the British government in the violent conflict with the Provisional IRA and UVF in Northern Ireland known as the " Troubles". A peace settlement for Northern Ireland, the Belfast Agreement, was approved in 1998 in referenda north and south of the border, and is currently being implemented, albeit more slowly than many would like. The state is a republic, with a parliamentary system of government. The President of Ireland, who serves as head of state, is elected for a seven-year term and can be re-elected only once. The president is largely a figurehead but can still carry out certain constitutional powers and functions, aided by the Council of State, an advisory body. The Taoiseach ( prime minister), is appointed by the president on the nomination of parliament. The Taoiseach is normally the leader of the political party which wins the most seats in the national elections. It has become normal in the Republic for coalitions to form a government, and there has not been a single-party government since the period of 1987–1989. The bicameral parliament, the Oireachtas, consists of a Senate, Seanad Éireann, and a lower house, Dáil Éireann. The Seanad is composed of sixty members; eleven nominated by the Taoiseach, six elected by two universities, and 43 elected by public representatives from panels of candidates established on a vocational basis. The Dáil has 166 members, Teachtaí Dála, elected to represent multi-seat constituencies under the system of proportional representation by means of the Single Transferable Vote. Under the constitution, parliamentary elections must be held at least every seven years, though a lower limit may be set by statute law. The current statutory maximum term is every five years. Leinster House, the seat of Oireachtas Éireann (the Irish parliament). The Government is constitutionally limited to fifteen members. No more than two members of the Government can be selected from the Senate, and the Taoiseach, Tánaiste (deputy prime minister) and Minister for Finance must be members of the Dáil. The current government consists of a coalition of two parties; Fianna Fáil under Taoiseach Bertie Ahern and the Progressive Democrats under Tánaiste Michael McDowell. The main opposition in the current Dáil consists of Fine Gael and Labour. Smaller parties such as the Green Party, Sinn Féin and the Socialist Party also have representation in the Dáil. Ireland joined the European Union in 1973. These counties are grouped together into regions for statistical purposes. The island of Ireland extends over 84,421 km² of which 83% (or five-sixths) belong to the Republic (at 70,280 km²), with the remainder constituting Northern Ireland. It is bound to the west by the Atlantic Ocean, to the northeast by the North Channel. To the east is found the Irish Sea which reconnects to the ocean via the southwest with St George's Channel and the Celtic Sea. The west-coast of Ireland mostly consists of cliffs, hills and low mountains (the highest point being Carrauntoohil at 1,041 m). In from the perimeter of the country is mostly relatively flat farmland, traversed by rivers such as the River Shannon and several large lakes or loughs. The centre of the country is part of the River Shannon watershed, containing large areas of bogland, used for peat production. The local temperate climate is modified by the North Atlantic Current and is relatively mild. Summers are rarely very hot (temperatures only exceed 30ºC usually once every decade, though commonly reach 29ºC most summers), but it freezes only occasionally in winter (temperatures below -5ºC are very rare). Precipitation is very common, with up to 275 days with rain in some parts of the country. 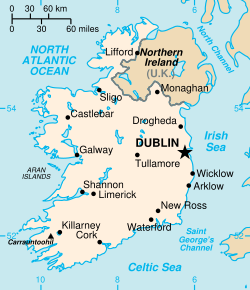 Chief cities are the capital Dublin on the east coast, Cork in the south, Limerick, Galway on the west coast, and Waterford on the south east coast (see Cities in Ireland). The education system is under the direction of the government via the Minister for Education and Science (currently Mary Hannifan). Recognised primary and secondary schools must adhere to the curriculum established by authorities that have power to set them. The economy of Ireland has transformed in recent years from an agricultural focus to one dependent on trade, industry and investment. Economic growth in Ireland averaged an exceptional 10% from 1995–2000, and 7% from 2001–2004. Industry, which accounts for 46% of GDP, about 80% of exports, and 29% of the labor force, now takes the place of agriculture as the country's leading sector. Exports play a fundamental role in the state's robust growth, but the economy also benefits from the accompanying rise in consumer spending, construction, and business investment. On paper, the country is the largest exporter of software-related goods and services in the world. In fact, a lot of foreign software, and sometimes music, is filtered through the country to avail of the state's non-taxing of royalties from copyrighted goods. One key reason for the country's economic surge might be the government's role in the past ten years. A number of initiatives to address the problems of high inflation (with poor results in recent years), large tax burdens, government spending, lack-lustre foreign investment and low job skills have been introduced. A key part of economic policy, since 1987, has been Social Partnership which is a neo-corporatist set of voluntary 'pay pacts' between the Government, employers and trades unions. These usually set agreed pay rises for three-year periods. 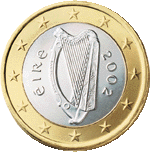 The state joined in launching the euro currency system in January 1999 (leaving behind the Irish pound) along with ten other EU nations. The 1995 to 2000 period of high economic growth led many to call the country the Celtic Tiger. The economy felt the impact of the global economic slowdown in 2001, particularly in the high-tech export sector — the growth rate in that area was cut by nearly half. GDP growth continued to be relatively robust, with a rate of about 6% in 2001 and 2002. Growth for 2004 was over 4%, and for 2005 was 4.7%. With high growth came high levels of inflation, particularly in the capital city. Prices in Dublin, where nearly 30% of Ireland's population lives, are considerably higher than elsewhere in the country , especially in the booming property market. Ireland has the fourth-highest GDP (based on PPP) per capita in the world after Luxembourg, Norway and the United States, and lies 4th in the 2006 UN Human Development Index, which counts GDP per capita as a factor. The Economist Intelligence Unit's Quality of Life Index ( ) placed Ireland in 1st place in its World in Review 2005 survey. Poverty figures show that 6.8% of Ireland's population suffer "consistent poverty" (2004). The Republic's armed forces are organised under the Irish Defence Forces ( Óglaigh na hÉireann). The Irish Army is relatively small(compared to other armies in the region), but well equipped, with 8,500 full-time military personnel (13,000 in the reserve army). This is principally due to Ireland's designation as a neutral country. Due to the "triple-lock" rules governing participation in conflicts, deployments are on UN peace-keeping duties and protection of the Republic's territorial waters (in the case of the Irish Naval Service). See Irish neutrality. There is also an Irish Air Corps and Reserve Defence Forces ( Irish Army Reserve and Naval Service Reserve) under the Defence Forces. Over 40,000 servicemen have served in UN peacekeeping missions around the world. The Irish peoples are mainly of indigenous Neolithic ancestry; although some of the population are also of English, Scottish, Anglo-Norman, Viking and Welsh ancestry, these groups have been assimilated and do not form distinct minority groups. Celtic culture and language forms an important part of national identity (see language section below). The Irish Travellers are an ethnic minority group. The official languages are Irish and English. Teaching of the Irish language is compulsory in primary and secondary level schools which receive money and recognition from the state. Some students may be exempt from the requirement to receive instruction in the language. English is by far the predominant language spoken throughout the country. People living in predominantly Irish-speaking communities (the Gaeltacht) are limited to the low tens of thousands in isolated pockets largely on the western seaboard. Roads signs are usually bilingual, except in the Gaeltacht, where they are in Irish only. The legal status of place names has recently been the subject of controversy, with an order made in 2005 under the Official Languages Act changing the official name of certain locations from English to Irish (e.g. Dingle is now officially named An Daingean). Most public notices are only in English, as are most of the print media. National media in Irish exist on TV, radio, and in print. According to "Marketing Ireland" Ireland has experienced a massive influx in the number of people from the 10 new EU accession states. Some 210,000 PPS numbers have been issued to people from Poland, Lithuania, Latvia and Estonia. 140,000 PPS number have been given to Poles in Ireland. However, not all those who have received PPS numbers will have remained in Ireland. There are also around 10,000 Americans living in Ireland. There is also a significant Asian, largely Chinese, community in Ireland with an estimated 22,000 people and a Nigerian population of around 9,000 in 2002 . It is estimated that 10,000 Poles arrive in Ireland to work every month. Allowing for the incidence of births (245,000) and deaths (114,000), the derived net immigration of people to Ireland between 2002 and 2006 was 186,000. It is estimated that the cohort of non-nationals resident in Ireland is of the order of 400,000 — a number that will be clarified in April 2007. The average annual rate of increase, 2%, is the highest on record – compared to 1.3% between 1996 and 2002 and 1.5% between 1971 and 1979. The 2006 population was last exceeded in the 1861 Census when the population then was 4.4 million The lowest population of Ireland was recorded in the 1961 Census – 2.6 million. All provinces of Ireland recorded population growth. The population of Leinster grew by 8.9%; Munster by 6.5%; and the long-term population decline of Connacht – Ulster has stopped. The ratio of males to females has declined in each of the four provinces between 1979 and 2006. Leinster is the only province where the number of females exceeds the number of males. Males predominate in rural counties such as Cavan, Leitrim, and Roscommon while the are more females in cities and urban areas. 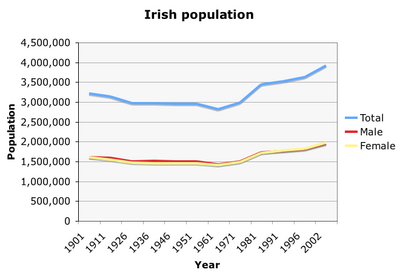 Detailed statistics into the population of Ireland since 1841 are available at Irish Population Analysis. 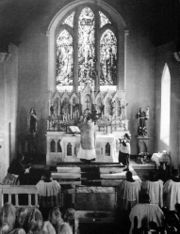 A Roman Catholic Mass in Ireland, ca. 1950. The population of Ireland is still predominantly Roman Catholic. The National Cathedral of the Church of Ireland, part of the Anglican communion. 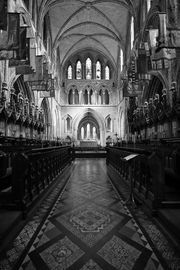 The Republic of Ireland is 88% nominally Roman Catholic, and has one of the highest rates of church attendance in the Western World. However, there has been a major decline in Mass attendance among Irish Catholics since the liturgical, disciplinary and theological reforms of the Second Vatican Council were implemented. Between 1996 and 2001, regular Mass attendance, already previously in decline, declined from 60% to 48% (it had been above 90% before 1973), and all but two of its sacerdotal seminaries have closed. The second largest Christian denomination, the Church of Ireland (Anglicanism), having been in decline for most of the twentieth century, has now experienced an increase in membership, according to the 2002 census, as have other small Christian denominations, and Islam. The largest other Protestant denominations are the Presbyterian Church in Ireland, followed by the Methodist Church in Ireland. The very small Jewish community in the state also recorded a marginal increase(see History of the Jews in Ireland). The 1937 Constitution of Ireland gave the Roman Catholic Church a "special position" as the church of the majority, but also recognised other Christian and Jewish sects. As with other predominantly Roman Catholic European states (e.g., Italy), the Irish state underwent a period of legal secularisation in the late 20th century. In 1972, the articles mentioning specific religions groups, including the Catholic Church were deleted from the Irish constitution by the Fifth Amendment of the Constitution of Ireland. The article also establishes freedom of religion (for belief, practice, and organisation without undue interference from the state), prohibits endowment of any particular religion, prohibits the state from religious discrimination, and requires the state to treat religious and non-religious schools in a non-prejudicial manner. Catholic and Protestant attitudes in 1937 also disfavoured divorce, which was prohibited by the original Constitution. It was not until 1995 that the Fifteenth Amendment repealed this ban. The island of Ireland has produced the Book of Kells, and writers such as George Berkeley, Jonathan Swift, James Joyce, George Bernard Shaw, Richard Brinsley Sheridan, Oliver Goldsmith, Oscar Wilde, W.B. Yeats, Patrick Kavanagh, Samuel Beckett, John Millington Synge, Seán O'Casey, Séamus Heaney, Bram Stoker and others. Shaw, Yeats, Beckett and Heaney are Nobel Literature laureates. Other prominent writers include John Banville, Roddy Doyle, Séamus Ó Grianna, Dermot Bolger, Maeve Binchy, Frank McCourt, Edna O'Brien, Joseph O'Connor, John McGahern and Colm Tóibín. Ireland is known for its Irish traditional music, but has produced many other internationally influential artists in other musical genres; Blues guitarist Rory Gallagher, folk singer Christy Moore, the Wolfe Tones, Shane MacGowan with his band The Pogues and singer Sinéad O'Connor. In classical music, the Island of Ireland was also the birthplace of the notable composers Turlough O'Carolan, John Field (inventor of the Nocturne), Gerald Barry, Michael William Balfe, Sir Charles Villiers Stanford and Charles Wood. Successful entertainment exports in the late twentieth century include acts such as Horslips, U2, Thin Lizzy, Boomtown Rats, The Corrs, Boyzone, Ronan Keating, The Cranberries, Flogging Molly, Gilbert O'Sullivan, Westlife and Enya, and the internationally acclaimed dance shows Riverdance and Lord of the Dance. In the early twenty-first century, Damien Rice rose to international fame. Notable Irish Hollywood actors include Barry Fitzgerald, Colin Farrell, Liam Neeson, Pierce Brosnan, Gabriel Byrne, Daniel Day Lewis (by citizenship), Colm Meaney and Cillian Murphy. Ireland has produced a number of talented sportsmen and women. In soccer, former players include Roy Keane, Packie Bonnar and Paul McGrath, while footballers whose careers are ongoing include Shay Given and Robbie Keane. In rugby Ireland has produced Ronan O'Gara and Brian O'Driscoll while in athletics Sonia O'Sullivan and Derval O'Rourke have had success in international events. Notable GAA players include the now retired pair of DJ Carey and Peter Canavan. Ernest Walton of Trinity College Dublin shared the 1951 Nobel Prize in Physics for "splitting the atom". William Rowan Hamilton was a significant mathematician.